Affirmations are your tool, your keys to the life you are dreaming about. Why? What are they? And who am I kidding when I repeat and fool myself about something that I know is not my reality. Well, that exactly is the case. It is not your reality NOW, but once you start using them properly, you will discover their magical power and will never want to give up on them. Affirmations affirm (obviously) that something strongly IS. It is your way of “affirming”, of confirming that what you desire actually IS happening NOW. We all have our inner dialogues about all the possible subjects: our life, world, other people, fear, dreams, etc. Remember that what we tell ourselves is THE foundation on which we build our reality. Our reality is NOT what is happening to us but our perception of it! Also, what we are experiencing at this moment is only the outcome of our thoughts and beliefs from the past. Once we change our beliefs, we will start experiencing a completely different reality. Doing affirmations daily does not mean we are twisting the truth. If you ever feel that it doesn't resonate with you, then please refrain yourself from doing it in such a way that hurts you or makes you feel anything less than good, because then you will feel as if you are forcing yourself into something that is not natural. You should use them in a way that will help you to swap the inner dialogue that doesn’t serve us anymore with the inner dialogue that does! They allow the old, used up inner dialogues to be exchanged with positive, new ideas and concepts. How do we write affirmations? Always in the present moment, as if it happening NOW (not in the future because it will then stay in the future and we certainly don’t want that). Here you are NOT lying to yourself, you are acknowledging that everything is first created on a mental level before it manifests in our reality! You will see it when you believe it. And you will believe it after repeating it, just like we adopted old patterns that someone else has repeated so many times to us that in the end we actually started believing in them and taking them for a fact! Always affirm what you WANT and NOT what you don’t want. What you create in your life is what you focus on. Where focus goes, energy flows. Have this in mind. What you resist, persists! For example, instead of saying "I am not late anymore," say: "I am always arriving on time and I do that with ease and pleasure." Keep it short & simple but emotionally powerful. Make sure they resonate with you and that when you say them out loud, they excite you! While affirming be aware that you are CREATING YOUR NEW REALITY. You are not fixing your current situation, in that case that would be a resistance to what is and could create inner conflicts. Here you have accepted what is but you are creating a whole new experience for yourself by changing the old beliefs that do not serve you any longer. Affirmations help you create a new attitude towards life, attitutde that will allow you to live a positive experience. When saying them out loud, (try) believe they are real and invest full mental and emotional energy into them, at least for a minute or two. The more real you can imagine them, the more likely (and sooner) the are to become your reality. Read them out loud/record them and listen to them whenever you can! Preferably as soon as you wake up - that is when our subconsciousness is easiest to reprogram. When and how to do Affirmations? Before you start any inner work, you should have in mind that your goal is to (eventully) detach from the outcome. Being attached to the outcome and our expectations are actually preventing things to start unfolding. When we wish to create a new reality for us, new job, better relationship, higher salary, we are mainly doing it with one single goal - to feel happier and to feel good. By doing the inner work, we become aware that we already have everything we need inside of us. Above all, we are the source of our happiness and our "feel good" source. No external circumstances can fulfill the inner void, no external factor can be the source of our happiness for a long period of time. Knowing this, it would help us do the affirmations then, not to achieve something in the future but mainly to start feeling good in the present moment. Once we start feeling good NOW, and in the next moment, and the next and the next, we immediately start attracting things that we want. 1. Meditation - during your meditation or relaxation, before going to sleep or just when you wake up. I do them as part of my morning rituals. I don't even open my eyes, I have the headphones on and I am reprogramming my subconciousness. 2. Saying them out loud - repeating them whenever you think of them, whenever you are free to do it, when you are looking at yourself in the mirror, or recording an audio of your affrimations that you can play when you are exercising, driving, jogging, cooking. I even did a video of myself being "interviewed" where I talked about myself, my new life, my new story and all the wonderful things I wanted for myself. I watch it every single day! (I focus on what I want). "I am always in a good mood", " Maja, you are always in a good mood", "Maja, she is always in a good mood." 3. Writing affirmations down and thinking about them while writing them, or writing them down and having them as a reminder around the house (like in my case, in the bathroom, on the mirror, in the kitchen and by the bed!). 4. What I realized worked great for me was when someone would ask me something that I would usually complain about before, now, I would reply with my affirmation. For example, I wanted to sell my car for a long time but I didn't feel good about doing it (I have no idea about cars, and just a thought of men calling and asking questions about it, made me postpone the whole thing). Before I would be so frustrated when thinking about the whole process of selling it, and by thinking or talking about this "frustration" - what would I be doing? Focusing and giving energy to what I didn't want, and by talking about situation I didn't like, I was only creating more of it. So, I changed my story. I was saying that my car is just about the be sold, and that it happened without any effort put into it (and it really did happen like that, it happened so easily that even I couldn't believe it!). When you shift your focus and energy, you either start noticing things that you did not notice previously due to the frustration, and also, since you shifted your focus and energy, the whole perception changes, and so does the situation you are in. Try it, don't take me up on that. Try it yourself! 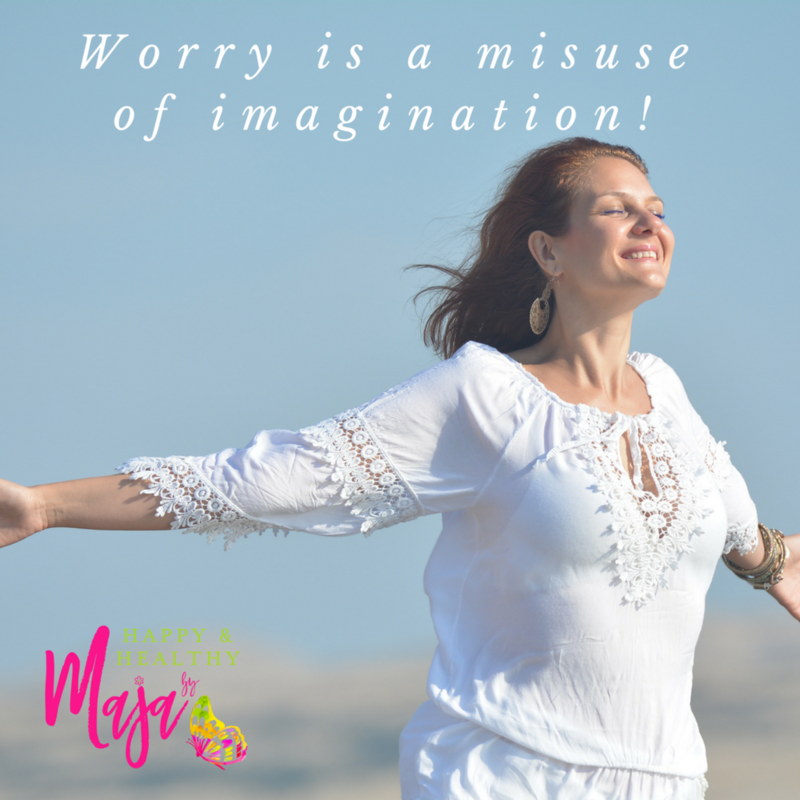 I was inspired to write this blog post as I am doing a One Month Mindset Challenge in my ladies-only facebook group: "YES, I CAN ! - The Power is in You!" and I am sharing tools that helped me transform my life and feel great every single day, no matter the external circumstances. I realzied that many ladies did not use this tool nor did they know how to use it, how to write them and how powerful it is. If you are a lady, willing to reignite the inner power, I invite you to join our happy & healthy community and be part of this amazing energy. If you are not a lady (or Facebook fan) but still want to stay up to date with what I do, please follow my Facebook page or my Youtube channel: Happy & Healthy by Maja.